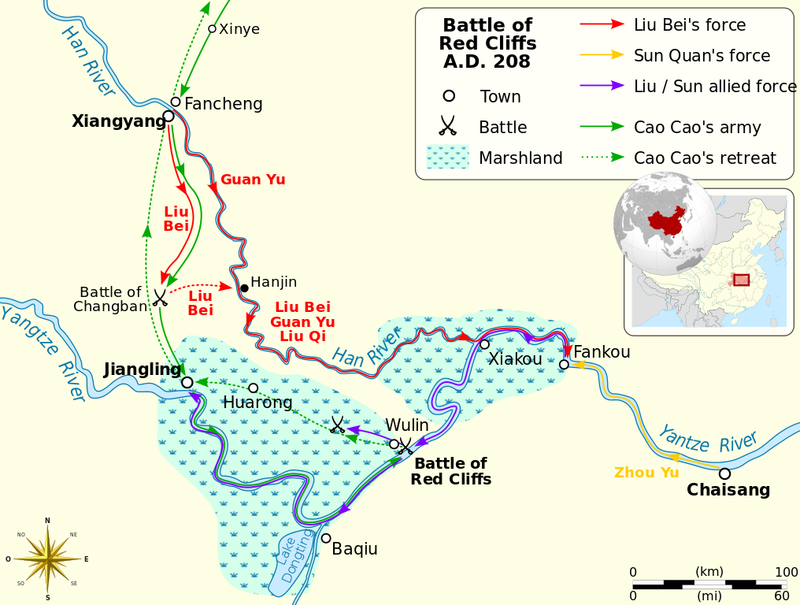 The Battle of Chibi (Red Cliffs) between Cao Cao and the coalition of Liu Bei and Sun Quan took place at Red Cliffs (present-day northeast of Jiayu, Hubei Province) in AD 208. Cao Cao whose courtesy name was Mengde was born in the Qiao County (present-day Bozhou, An- hui). His father, Cao Song who served in the court as the grand commander was the foster son of Cao Teng who in turn was one of the favorite eunuchs of Emperor Huan. At the age of twenty, Cao Cao was recommended for a promotion to northern district commander of Luoyang. When the Yellow Turban Rebellion broke out, Cao Cao was recalled to put down the rebels. He was successful in his military exploits and was promoted to dianjun xiaowei (a military position). Cao Cao, intelligent and courageous, was well versed in both polite correspondence and martial arts. He liked to enlist the service of capable people, and there were many brave and talented men working for him. Later, the warlords formed a coalition with Yuan Shao against Dong Zhuo, and Cao Cao joined their cause. He was assigned to be the magistrate of Yanzhou Prefecture in AD 192. After defeating Yuan Shao at Guandu, Cao Cao conquered other warlords and united the north of China. After uniting the north, Cao Cao prepared to march south to unify the country. The overlord of Jinzhou Prefecture, Liu Biao, had just died after a period of illness. Under pressure from Cao Cao’s forces, Liu Cong, Liu Biao’s younger son and successor, quickly surrendered. When Jingzhou fell, Liu Bei and Liu Biao’s elder son Liu Qi immediately led about twenty thousand soldiers to Xiakou (present- day Hankou). Although Cao Cao claimed that he had eight hundred troops at his disposal, Zhou Yu estimated Cao Cao’s actual troop numbers to be closer to two hundred and twenty thousand after conquering Jingzhou. Cao Cao’s army was advancing from Jiangling down the Yangtze River toward Xiakou. Liu Bei’s main advisor Zhuge Liang was sent to negotiate the formation of an alliance against Cao Cao with Sun Quan. Sun Quan was from Fuchun in the Wu Prefecture (present-day Fuyang, Zhejiang Province) and called himself Zhongmou. His father, Sun Jian, and elder brother, Sun Ce, were famous generals. In the last years of the Eastern Han Dynasty, Sun Ce acquired six prefectures southeast of the Yangtze River with the support of influential families. In AD 200, the eighteen-year-old Sun Quan inherited land from his brother. Sun Quan, under the tutelage of Zhou Yu, Zhang Zhao, and other able advisors, continued to build his power base along the Yangtze River. When Cao Cao led his army to pacify the south, Sun Quan was twenty-five years old. He was aware of the fact that his regime would be in danger if Cao Cao got a firm foothold in Jingzhou. In the end, Sun Quan decided to oppose Cao Cao. He sent generals Zhou Yu, Lu Su, and Cheng Pu with 30,000 soldiers to form a coalition with Liu Bei’s troops, which numbered 20,000. The supreme commander of the united forces was Zhou Yu, whose courtesy name was Gong Jin, a native of Shu County, Lujiang Prefecture (present-day Shucheng city, Anhui Province). He was the chief general of the Wu state. Zhou Yu was born into a bureaucratic family, and made close friends with Sun Ce at a young age. Zhou Yu later helped Sun Ce to conquer the six prefectures southeast of the Yangtze River and was promoted to jiangwei zhonglangjiang. Zhou Yu was called Zhou Lang (gentleman) by the local people, as he was young and handsome. Sun Ce died at a young age, and Zhou Yu and Zhang Zhao were entrusted to assist Sun Quan. Zhou was appointed as qianbu Dadudu. Zhou Yu and Lu Su were boldly advocating war against Cao Cao. The combined Sun-Liu force sailed upstream to the Red Cliffs where they encountered Cao Cao’s vanguard force. Cao Cao’s men could not gain an advantage in the small skirmish which ensued, so Cao Cao retreated north of the Yangtze River and the allies pulled back to the south. Cao Cao had moored his ships stem to stern, possibly aiming to reduce seasickness in his naval troops, who were mostly northerners and were not used to living on ships. Observing this, Zhou Yu’s divisional commander Huang Gai feigned surrender and prepared a squadron of capital ships. The ships had been converted into fire ships by filling them with bundles of dry reeds and oil. As Huang Gai’s “defecting” squadron approached the midpoint of the river, the sailors set fire to the ships before escaping in small boats. The unmanned fire ships, driven by the southeastern wind, sped toward Cao Cao’s fleet and set it ablaze. As all the ships were moored together, it was impossible for the ships to sail away. Within a short time, smoke and flames stretched across the sky and Cao Cao’s fleet turned into a sea of fire. Soon, the raging flames extended to the camps on the bank. Many men and horses were either burned to death or drowned. Unfortunately for Cao Cao’s army, the allies, led by Zhou Yu and Liu Bei, gave chase over land and water. Due to famine, disease, and skirmishes along the way, many of Cao Cao’s remaining forces perished. Cao Cao then retreated northward and was not able to dispatch military expedition to the south. In AD 220, Cao Cao died of illness. His son Cao Pi deposed Emperor Xian of Han and proclaimed himself emperor of Wei, making Luoyang his capital. With Zhuge Liang’s assistance, Liu Bei occupied most of the Jingzhou Prefecture. Shortly after that, he expanded his territory westward and seized Liu Zhang’s Yizhou Prefecture. The year after Cao Pi proclaimed himself emperor, Liu Bei declared himself emperor of Han, which was historically known as the Kingdom of Shu or Shu Han, and made Chengdu its capital. Sun Quan had further strengthened his force in the middle and lower reaches of the Yangtze River. In AD 229, Sun Quan named himself emperor of Wu and made Jianye (now Nanjing) the capital. This was the start of three kingdoms: Wei, Shu, and Wu. This entry was posted in Battle, China by MSW. Bookmark the permalink.